Nonstimulatory or endogenous peptide–MHC (pepMHC) presented on the surfaces of APCs, either alone or alongside agonist pepMHC, plays various roles in T cell selection and activation. To examine these properties in more detail, we explored several model systems of TCR and pepMHC ligands with sufficient affinity to be activated in the absence of CD8. The TCRs had a range of affinities for agonist and nonstimulatory ligands and were restricted by MHC class I alleles with different properties. We observed CD8-independent antagonism from TCR–pepMHC interactions with very low affinities (e.g., KD = 300 μM). In addition, endogenous peptide–Ld complexes on APCs antagonized activation of coreceptor (CD8)-negative 2C T cells even by the strong agonist QL9–Ld. In contrast, TCRs m33 and 3D-PYY, restricted by Kb and Db, respectively, did not show signs of antagonism by endogenous pepMHC in the absence of CD8. This did not appear to be an inherent difference in the ability of the TCRs to be antagonized, as altered peptide ligands could antagonize each TCR. In the presence of CD8, endogenous pepMHC ligands acted in some cases as coagonists. These results show that endogenous pepMHC molecules exhibit complex behavior in T cells, leading to either reduced activity (e.g., in cases of low coreceptor levels) or enhanced activity (e.g., in presence of coreceptor). The behavior may be influenced by the ability of different TCRs to recognize endogenous pepMHC but also perhaps by the inherent properties of the presenting MHC allele. T cells become stimulated when their clonotypic TCRs detect stimulatory peptide bound to products of the MHC on the surfaces of APCs. Typically, though, when a T cell interacts with an APC, it is exposed to a diverse set of peptide–MHC (pepMHC) complexes, most of which are nonstimulatory. A subset of the nonstimulatory endogenous pepMHC may still interact with the TCR with low affinity; in fact, a requirement for recognizing endogenous pepMHC drives T cell positive selection (reviewed in Ref. 1). A sharp affinity threshold has been defined where weaker TCR–pepMHC interactions result in positive selection of clones, whereas higher-affinity interactions result in negative selection (2), showing the importance of weak binding to endogenous complexes. Self-peptides mediating positive selection signals have been isolated for CD8 (2–5) and CD4-resticted (6, 7) TCRs. Endogenous pepMHC complexes are also involved in providing T cell survival signals in the periphery, in the absence of fully activating pepMHC (6–8). The affinity ranges for TCR binding to endogenous pepMHC are quite low and difficult to measure by surface plasmon resonance; in fact, very few positively selecting pepMHC–TCR interactions have been explicitly measured. Those that have been measured ranged from 20 to 210 μM (measured at 10–25°C) (9–11). In addition to signals resulting from interactions with nonstimulatory pepMHC complex alone, there have also been reports describing a coagonist role for these complexes alongside stimulatory pepMHC complexes. The presence of nonstimulatory pepMHC complexes has been shown to enhance activation by agonist pepMHC for CD4+ T cells (12, 13) and CD8+ T cells (14, 15). CD4 T cells have shown a restricted peptide specificity for the nonstimulatory coagonists (12, 13), whereas CD8 cells have been reported to respond to any class I pepMHC tested (14, 15), suggesting that in the latter case, the interaction with CD8, and not necessarily the TCR, is critical. In this study, we took advantage of TCR–pepMHC interactions that were of sufficient affinity to result in CD8-independent stimulation (16, 17). This allowed us to compare the responses of T cells to nonstimulatory pepMHC presented at the same time as an agonist pepMHC, with or without the expression of the coreceptor CD8. We found that in the absence of CD8, T cells experienced peptide-specific antagonism by nonstimulatory complexes that cannot be explained by peptide competition for MHC. Even high-affinity, in vitro-engineered TCRs were subjected to efficient antagonism. Quite weak interactions of at least KD = 300 μM were able to mediate this antagonist effect. Antagonism was also mediated by endogenous pepMHC complexes when the 2C TCR was stimulated via its allospecific ligand QL9–Ld in the absence of CD8. When CD8 was expressed, however, the nonstimulatory complexes were converted into coagonists. SIY (SIYRYYGL), SIY R4A (SIYAYYGL), OVA (SIINFEKL), QL9 (QLSPFPFDL), QL9 F5A (QLSPAPFDL), QL9 F5R (QLSPRPFDL), MCMV (YPHFMPTNL), and WT1 (RMFPNAPYL) peptides were synthesized by the Macromolecular Core Facility of the Section of Research Sources, Penn State College of Medicine. Peptides were purified by reverse-phase chromatography using a C-18 column; mass was confirmed by MALDI. Peptide quantification by amino acid analysis was performed at the Molecular Structure Facility, University of California Davis (Davis, CA). T2 (TAP-deficient lymphoblastoid cell line transfected with either H-2Kb, H-2Db, or H-2Ld), P815 (Ld+ mastocytoma), EL4 (KbDb+/+ thymoma), MC57-Ld (KbDb+/+ fibrosarcoma transduced with H2-Ld, a gift from Hans Schreiber, University of Chicago) and the 58−/− T cell hybridoma (TCR αβ negative, CD8 coreceptor negative, H-2k) were maintained in RPMI 1640 complete media (supplemented with 10% FCS, l-glutamine, penicillin, and streptomycin). 58−/− T cell hybridomas were also transduced to express 2C, m33, Y48βA, Y26αA, or 3D-PYY TCRs with the MSCV retrovirus as previously described (16), and the cells were maintained similarly in complete RPMI with or without co-transfection with the CD8αβ coreceptor under G418 selection. The CD8-independent TCR 3D-PYY was engineered from the 3D TCR, which was derived from a T cell clone isolated from a B6 mouse that was primed with activated RMFPNAPYL peptide-pulsed adherent splenocytes, and boosted with recombinant Listeria monocytogenes encoding the RMFPNAPYL epitope. The 3D-PYY mutant was identified using a T cell display system as has been previously described (18) and selection with WT-1/Db Ig DimerX (BD Biosciences). High-affinity single-chain T cell receptor (scTCR) constructs were expressed as inclusion bodies in Escherichia coli. The inclusion bodies were solubilized in 6 M guanidine at 37°C, then added to 400 ml denaturing solution (3 M urea, 2 mM reduced glutathione, 0.2 mM oxidized glutathione, pH 8) at 4°C. Dilution buffer (200 mM NaCl, 50 mM Tris, pH 8) was added dropwise over 36 h, and the protein was purified using Ni-NTA agarose beads (Qiagen) followed by purification over a Superdex 200 gel filtration column (GE Healthcare). Purified scTCR was chemically biotinylated using the EZ-Link Sulfo-NHS-LC-Biotinylation Kit (Pierce) and repurified by gel filtration shortly before use. APCs were incubated with the indicated concentrations of peptide in complete RPMI media for 2 h at 37°C. The cells were washed in PBS with 1% BSA and incubated with saturating amounts (more than 20 times higher than the KD) of soluble, high-affinity scTCR (20 μg/ml biotinylated m3 scTCR, and 40 μg/ml biotinylated m67 scTCR for QL9–Ld and SIY–Kb, respectively) for 2 h on ice. The cells were washed with ice-cold PBS with 1% BSA and incubated with streptavidin labeled with PE (BD Pharmingen) at a 1:100 dilution in PBS with 1% BSA for 30–45 min on ice. The cells were washed again and analyzed by flow cytometry using a BD FACSCanto (BD Biosciences) or a C6 flow cytometer (Accuri Cytometers). where x is the concentration of peptide added, y is the IL-2 release, a and b are the maximum and minimum IL-2 release measured, respectively, c is the IC50 or SD50, and d is the slope of the increase or decrease. The 2C TCR is a well-defined receptor system consisting of both syngeneic [SIY–Kb (19)] and allogeneic [QL9–Ld (20)] pepMHC ligands. In addition to the wild-type receptor, a series of engineered TCR mutants that bind with various affinities to both ligands have been made and characterized (16, 21, 22). Antagonism has been shown previously for the 2C TCR in CD8-positive T cells by various synthetic peptides presented by the syngeneic MHC H2-Kb (23); however, antagonism had not been shown for this TCR without expression of the CD8 coreceptor. To examine the relationships of TCR binding affinity and antagonism in the absence of coreceptor, we determined whether T cell hybridomas that express CD8-independent TCRs (2C or a higher-affinity 2C mutant m33 and its derivatives) without CD8 could be antagonized by altered peptide ligands. A summary of binding properties and effects on stimulation or antagonism is shown in Table I for the TCR–pepMHC interactions explored below. Cells that express the 2C TCR can be stimulated by QL9–Ld in the absence of CD8, owing to an interaction affinity above the CD8-dependent threshold [KD ∼1 μM (20, 24, 25)]. 2C T cells are stimulated to release IL-2 by 100 pM QL9 peptide presented by T2-Ld cells (Fig. 1A), which are TAP deficient and lack the ability to present endogenous peptides on class I MHC. To determine if this CD8-independent activity could be antagonized by low-affinity interactions, we used the altered peptide QL9 F5R. F5R binds well to Ld [KD = 0.9 to 2 nM estimated from MHC stabilization assays (17, 25)], but the affinity of the 2C TCR for F5R–Ld complex is very low [KD = 300 μM (25)]. The F5R peptide was able to antagonize 2C activity with an IC50 of 0.44 ± 0.27 nM, whereas null peptide, MCMV, which also binds well to Ld [KD = 0.5 nM estimated from MHC stabilization (26)], exhibited more than 1000-fold lower inhibitory activity (average IC50 of 1.7 μM) (Fig. 1A). This result indicates that antagonism can be mediated by the TCR–pepMHC interaction alone, without a requirement for CD8 participation. When CD8 is expressed, 2C can recognize QL9 F5R–Ld as an agonist peptide, whereas MCMV–Ld remains a “null” interaction (25). Activation of CD8-negative T cells is antagonized by specific pepMHC ligands that have lower affinity for the TCR. A, Activation, detected as IL-2 secretion in duplicate, of 2C T cells by QL9 presented by T2-Ld cells, with effects of added peptide QL9 F5R (antagonist, triangles) or MCMV (null, circles). Data are representative of two independent experiments. B, Activation of m33 Y48βA T cells in duplicate by QL9 presented by T2-Ld cells, with effects of added peptide QL9 F5R (antagonist, triangles) or MCMV (null, circles). Data are representative of two independent experiments. C, Activation of m33 T cells by SIY presented by T2-Kb cells, with effects of added peptide SIY R4A (antagonist, triangles) or OVA (null, circles). Data are representative of four independent experiments. We compared the 2C antagonism by QL9 F5R–Ld to the effects seen for the related TCR, m33 Y48βA. The m33 Y48βA TCR has an affinity for QL9–Ld comparable with that of 2C (1.4 μM and 1.2 μM, respectively; Supplemental Fig. 1), whereas its affinity for the syngeneic pepMHC ligand SIY–Kb (KD = 2.9 μM) is 12 times higher than that of 2C (16). Stimulation of T cells with the Y48βA TCR by 100 pM QL9 on T2-Ld cells was also efficiently antagonized by QL9 F5R (IC50 = 4.7 ± 0.4 nM), whereas MCMV inhibited activity only at higher concentrations (average IC50 of 4.8 μM) (Fig. 1B). Thus, a different receptor showed similar antagonist properties in the absence of CD8. Next, we analyzed whether it was possible to antagonize a very-high-affinity TCR–pepMHC interaction. The m33 TCR binds to SIY–Kb with 1000-fold higher affinity [KD = 30 nM (16, 24)] than that of the wild-type 2C TCR [KD = 30 μM (16, 21)], and as such T cells that express the m33 TCR are stimulated by SIY–Kb on T2-Kb cells even in the absence of CD8 (16, 17). The SIY peptide variant R4A binds to Kb with the same affinity as that of SIY, and the complexes have the same half-lives (∼10 h) on the surfaces of T2-Kb cells (27, 28). These Kb complexes are less stable than OVA–Kb, which has a half-life of 23 h (28). The binding of m33 TCR to R4A–Kb is reduced by more than 100-fold compared with SIY–Kb, as this residue is energetically important for TCR binding (27). R4A–Kb is unable to stimulate m33 T cells in the absence of CD8. Nevertheless, R4A was able to inhibit the activity of SIY at approximately a 20-fold lower concentration than that of OVA (IC50 = 0.15 nM and 2.9 nM, respectively) (Fig. 1C). The R4A effect is likely due to antagonism, rather than competition for Kb, as OVA–Kb complexes are more stable than R4A–Kb complexes and yet are less efficient at inhibiting activation by SIY. Thus, even very high-affinity TCR interactions can undergo antagonism with lower-affinity ligands in the absence of CD8. As shown earlier with null peptide ligands, inhibition can also occur through competition with the agonist peptide for MHC binding. To avoid this complicating effect, it is possible to use an APC that expresses two different MHC alleles, and a single TCR that can interact with peptides bound to each. MC57-Ld is an H-2b–derived tumor cell line that has been transfected with the gene for Ld. This cell line expressed high levels of H2-Kb and H2-Ld (Fig. 2A, 2B). 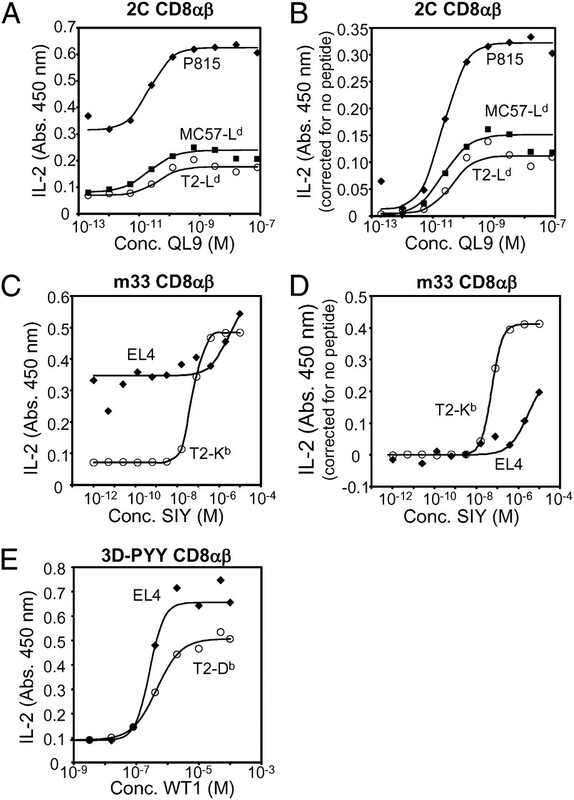 CD8-negative T cells that express the m33 Y48βA TCR were stimulated with the agonist QL9–Ld, and SIY was added to assess antagonist activity when presented by Kb. SIY–Kb is a full agonist for the Y48βA TCR when CD8 is coexpressed, but it does not stimulate the T cells when Y48βA is expressed without CD8 (16). 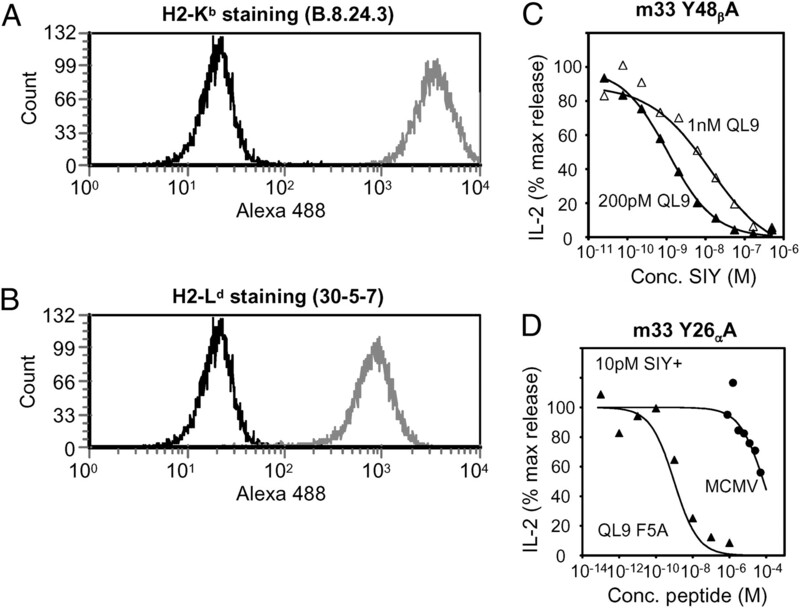 Addition of SIY peptide caused potent antagonism of Y48βA T cell stimulation by QL9–Ld (average IC50 = 1.1 ± 0.2 nM) (Fig. 2C). As expected, a higher level (5-fold) of agonist QL9–Ld required greater levels of SIY peptide, roughly 10-fold, for the same antagonist effect. This result supports the view that inhibitory signals are delivered through TCR binding to the antagonist pepMHC, even in the absence of CD8. Peptide antagonism using separate, noncompeting MHC alleles on MC57-Ld. A and B, Cells were stained on ice with (A) B.8.24.3, specific for H2-Kb, or (B) 30-5-7, specific for H2-Ld. Binding of the primary Ab was detected with a polyclonal goat anti-mouse Alexa 488 F(ab′)2 (Invitrogen Molecular Probes) and analyzed by flow cytometry. In each panel, the gray histogram depicts the cells stained with the MHC-specific Ab, and the black histogram represents cells stained with the secondary Ab only. C, Activation of m33 Y48βA T cells in triplicate by two concentrations of QL9 (open triangles, 1nM QL9; closed triangles, 200pM QL9) presented by H2-Ld on the surface of MC57-Ld cells, with effects of added SIY peptide, which is presented by H2-Kb on the surface of the APC. Data are representative of four independent experiments. D, Activation of m33 Y26αA T cells by SIY peptide presented by H2-Kb on MC57-Ld cells, with effects of added MCMV (null, circles) or QL9 F5A (antagonist, triangles), which are presented by H2-Ld on the surface of the APC. Representative data are shown from two independent experiments. Using the same MC57-Ld cells, we confirmed that a high-affinity interaction could be fully antagonized with the reciprocal combination of MHCs as agonist (Kb in this case) and antagonist (Ld in this case). The m33 Y26αA TCR has high affinity for SIY–Kb such that the T cell line is stimulated by SIY in the absence of CD8 [KD = 17 nM (16)]. T cells that express the m33 Y26αA TCR were stimulated in the presence of 10 pM SIY and MC57-Ld cells and various concentrations of QL9 variant F5A (antagonist) or MCMV (null) peptides, both presented by H2-Ld. Once again, the high-affinity agonist interaction with SIY–Kb could be fully antagonized by QL9 F5A–Ld (IC50 = 1.3 ± 0.8 nM) at more than 10,000-fold lower concentration than that of MCMV (IC50 > 10 μM) (Fig. 2D). The minimal inhibition at very high MCMV concentrations might result from increased levels of stabilized MCMV–Ld complexes on these cells competing for a common pool of β-2 microglobulin, resulting in lower total levels of Kb on the surface. Typically, APCs are TAP competent and present a variety of endogenous pepMHC along with potential agonist pepMHC. Various roles for endogenous pepMHC have been proposed, most often involving participation of coreceptor (12, 14, 29). In principle, the inhibitory signals associated with antagonist ligands as described in the lower-affinity altered peptide systems here could also be delivered through weak interactions with endogenous pepMHC. To analyze the effect of endogenous pepMHC for coreceptor-negative 2C T cells, we compared their stimulation by QL9–Ld presented by TAP-competent (MC57-Ld and P815) and TAP-negative (T2-Ld) APCs. Despite CD8-independent sensitivity to QL9–Ld, wild-type 2C T cells lacking CD8 were impaired when responding to QL9–Ld on the surfaces of TAP-competent cells (see Fig. 3A). For both TAP-competent lines, the maximum level of IL-2 secretion for 2C cells was significantly reduced. In contrast, the SD50 values for QL9 peptide were similar for T2-Ld and MC57-Ld (115 ± 100 pM and 28 ± 19 pM, respectively), with a shift to a slightly higher concentration for P815 (350 ± 70 pM). Activation of CD8-negative 2C T cells is antagonized by self-peptide–Ld ligands. A, IL-2 secretion detected in triplicate from activation of 2C T cells by QL9 presented by T2-Ld cells (open circles), P815 (closed diamonds), or MC57-Ld (closed squares). Data are representative of at least three independent experiments. B, Staining in duplicate of APCs for specific stimulatory complex QL9–Ld, using the soluble, high-affinity scTCR m3. Error bars represent SD of measurements, and data are representative of three independent experiments. C, High-affinity m3 scTCR staining and IL-2 secretion from 2C T cells stimulated by T2-Ld (128 pM QL9, highlighted with arrows labeled a in A and B), P815 (16 nM QL9, highlighted with arrows labeled b in A and B), and MC57-Ld (16 nM QL9, also indicated with arrows labeled b). We considered that there could simply be less agonist peptide loaded onto APCs when other, endogenous complexes are present, as existing peptide would have to be displaced from the MHC before the exogenously added peptide could be loaded. To investigate this possibility, we used a soluble, biotinylated, high-affinity TCR (called m3, KD = 27 nM for QL9–Ld) to specifically detect the levels of agonist pepMHC on the surfaces of the different APCs by flow cytometry (25). The peptide loading levels at equivalent exogenous peptide concentrations were, indeed, different depending on whether endogenous peptide–Ld complexes were present (Fig. 3B). However, we examined in more detail the QL9 concentrations that yielded the highest QL9–Ld surface levels on the P815 and MC57-Ld compared with lower surface levels on T2-Ld (Fig. 3C). For example, at 16 nM QL9, much higher levels of QL9–Ld were found on MC57-Ld and P815 than at 128 pM QL9 with T2-Ld (Fig. 3C). However, at these concentrations, there was considerably more activity with T2-Ld as the APC, despite lower levels of QL9–Ld (Fig. 3C). This is consistent with the possibility that endogenous pepMHC ligands act as antagonists on P815 and MC57-Ld. To analyze further the role of endogenous pepMHC in T cell activation (in the absence of CD8), we examined the Kb system, comparing T2-Kb and the TAP-sufficient line EL4. Here we used the m33 TCR that has high affinity for SIY–Kb (KD = 30 nM) and thus is stimulated by SIY in the absence of CD8. As with the QL9–Ld system, reduced sensitivity was observed for high-affinity m33 T cells that lacked CD8 when stimulated with SIY presented by cells with endogenous peptide–Kb (EL4) versus TAP-deficient cells (T2-Kb) (Fig. 4A). In this case, the maximum stimulation level was equivalent for both APC types, but the SD50 of SIY peptide was increased 100-fold when presented by EL4 (560 ± 210 nM) versus T2-Kb (17 ± 15 nM). We used the soluble, high-affinity TCR m67 [KD = 16 nM (21)] to detect specifically SIY–Kb on the surfaces of APCs, similar to the approach with soluble m3 TCR for quantification of QL9–Ld levels. The level of SIY–Kb detected on EL4 cells began to rise at ∼10-fold higher SIY peptide concentrations than those on T2-Kb cells. Unlike the observations with QL9–Ld, there were no SIY concentrations where higher levels of SIY–Kb were presented by EL4 than T2-Kb, yet there was correspondingly lower levels of stimulation by EL4 (Fig. 4C). Hence, in this case, the lower sensitivity in the presence of APCs with endogenous pepMHC could be explained, most simply, by reduced SIY loading and presentation by Kb on EL4. Antagonism is not evident for other CD8-independent TCRs beyond what can be explained by reduced agonist presentation. A, Activation of m33 T cells by cells presenting SIY/Kb in duplicate and (B) staining of APCs in duplicate for specific stimulatory complex SIY/Kb using the soluble, high-affinity scTCR m67 for T2-Kb cells (open circles) or EL4 (closed diamonds). Error bars represent standard deviations of measurements, and data are representative of two independent experiments. C, High-affinity m67 scTCR staining and IL-2 secretion from m33 T cells stimulated by EL4 (10 mM SIY, highlighted with arrows labeled a in A and B) and T2-Kb (2 mM SIY, highlighted with arrows labeled b in A and B). D, Activation of 3D-PYY T cells in duplicate by WT1 presented by T2-Db cells (open circles) or EL4 (closed diamonds). Data are representative of three independent experiments. Bona fide CD8-independent TCRs [i.e., those that are active in the absence of CD8, rather than those that are simply inhibited by anti-CD8 Abs (30)] are uncommon. However, we recently engineered a mouse TCR against WT1 peptide–Db Ag that has sufficient affinity to be CD8-independent (D. Aggen and D. Kranz, unpublished observations). T cells that express this TCR, called 3D-PYY, are stimulated specifically by WT1–Db complexes in the absence of CD8. Unlike the TCRs examined earlier, the 3D-PYY T cell hybridoma was stimulated equally well with WT1 peptide presented by EL4 (TAP competent) or T2-Db (TAP negative) (SD50s roughly 10 μM) (Fig. 4D). Thus, in this case, there is no evidence that 3D-PYY binds sufficiently to endogenous peptide–Db complexes to elicit antagonist behavior. These results also show that one cannot assume that an exogenous peptide loaded on a TAP-deficient line will stimulate T cells more effectively than the same peptide loaded on a cell line that contains endogenous peptides. Previous reports for CD4 (12, 13, 31) and CD8 (14, 15) T cells have shown that nonstimulatory pepMHC complexes can increase the stimulatory capacity of agonist pepMHC, acting as coagonists when coreceptor is expressed. However, this behavior can be difficult to observe, apparently depending on the differentiation state of the T cell, the effector function examined, and the strength of the agonist. Because in our cases all of the TCR–agonist reactions are strong, such that they were genuinely CD8 independent, we analyzed whether the antagonist behaviors observed in the absence of CD8 would demonstrate coagonist behavior in the presence of CD8. When 2C CD8+ T cells were stimulated with QL9–Ld presented by the different APCs, similar SD50 values were seen in the presence or absence of endogenous pepMHC (SD50 = 42 ± 39 pM for MC57-Ld, 30 ± 10 pM for P815, and 120 ± 110 pM for T2-Ld) (Fig. 5A). Because 2C was originally generated as an alloreactive T cell against P815 (32), we observed, as expected, that P815 cells acted as a stimulus for 2C CD8+ T cells in the absence of added QL9. It is not clear why MC57-Ld did not also yield higher levels of stimulation in the absence of QL9. Nevertheless, to compare the additional agonist effects of exogenous QL9, the stimulation levels in the absence of peptide were subtracted to yield the QL9-mediated agonist activity (Fig. 5B). The findings showed that the 2C CD8+ T cell responses to MC57-Ld and P815 presenting QL9 were superior to their responses to T2-Ld. Thus, in the presence of the CD8 coreceptor, the endogenous peptide–Ld complexes switched from providing an overall negative signal to an overall positive signal to 2C T cells. Stimulation of CD8-positive T cells can be enhanced by self-pepMHC ligands. A, Raw absorbance and (B) absorbance corrected by subtracting the absorbance of no peptide added measured for IL-2 secretion by 2C T cells stimulated in triplicate by QL9 presented by T2-Ld cells (open circles), P815 (closed diamonds), or MC57-Ld (closed squares). Data are representative of at least three independent experiments. C, Raw absorbance or (D) absorbance corrected by subtracting the absorbance of no peptide added measured for IL-2 secreted by m33 T cells stimulated in duplicate by SIY presented by T2-Kb cells (open circles) or EL4 (closed diamonds). Data are representative of at least three independent experiments. E, IL-2 secreted by 3D-PYY T cells stimulated by WT1 presented by T2-Db cells (open circles) or EL4 (closed diamonds). Data are representative of at least two independent experiments. One consequence of using our system of altered peptide ligand antagonism assays (Figs. 1, 2) is that all of the peptides that can antagonize without CD8 coexpression can act as full agonists when CD8 is present (17, 25, 27) (data not shown). Nevertheless, we attempted to analyze the effects of two of these peptides (SIY R4A and QL9 F5A) on activation by strong and weak agonists for the 2C TCR. In this altered peptide ligand assay, we did not see a coagonist effect for any of the peptide combinations tested for stimulation of 2C+ CD8 T cells (see Supplemental Fig. 2). The coagonist effect seen with endogenous complexes is in contrast to the lack of coagonist effect seen by altered peptide ligands. It is possible that the individual altered peptide ligands tested do not bind with properties in the exact range of some present among the many endogenous pepMHC complexes that can mediate either antagonist or coagonist behavior seen for 2C T cells with or without coreceptor, respectively. Alternatively, it is possible that the many different endogenous peptides among the peptide milieu may mediate a range of effects, and it is an averaged effect that differs when CD8 is or is not coexpressed. We also analyzed the effects of endogenous pepMHC on CD8+ T cell responses where there was less evidence for antagonism in the absence of CD8. Simulation of m33 CD8+ T cells by TAP-competent EL4 cells was significant without added peptide (Fig. 5C), as observed previously (21). However, subtraction of this basal level, as done with P815 and 2C CD8+ cells, showed that the sensitivity for SIY was not increased in the presence of endogenous pepMHC (SD50 = 1.4 ± 1.0 μM for EL4 and 30 ± 26 nM for T2-Kb) (Fig. 5D). Similarly, stimulation of 3D-PYY CD8+ T cells showed minimal effects in the presence of endogenous pepMHC (SD50 = 210 ± 110 nM for EL4 and 550 ± 80 nM for T2-Db) (Fig. 5E). Thus, like antagonism mediated in the absence of CD8, coexpression of CD8 resulted in one strong agonist–TCR interaction with enhanced effects of endogenous pepMHC but two high-affinity, engineered agonist–TCR interactions with no evidence of an effect of endogenous pepMHC. Enhanced agonist–TCR affinity reduced the apparent positive and negative effects of non-agonist pepMHC, even though cells with high-affinity TCRs without CD8 can be antagonized by defined altered peptide ligands (Figs. 1, 2). This is in agreement with results showing that there is a reduced coagonist effect mediated by endogenous pepMHC for strong agonists compared with that for weak agonists (15). Specific endogenous peptides bound to class II MHC can serve as both positive selecting ligands and as coagonists of mature CD4+ T cells (6, 7). Endogenous peptides bound to class I MHC can also act as coagonists for CD8+ T cells (14, 15) and provide cooperative binding in a CD8-dependent mechanism (29). However, in contrast to observations with CD4+ T cells, there has been no evidence that TCRs on CD8+ T cells contribute to the coagonist effects by binding to specific peptide–class I complexes. Using class I-restricted TCRs that have affinities for agonist allowing them to function in the absence of CD8, we show evidence that endogenous peptide–class I ligands can have effects on signaling directly through the TCR. Our strongest evidence for the role of endogenous pepMHC came from comparing the responses of 2C TCR T cells in the presence or absence of CD8 to the exact same APCs. Accordingly, the activity with QL9 peptide for CD8− cells was much stronger when endogenous pepMHC complexes were absent, whereas the activity with QL9 peptide for CD8+ cells was much stronger when endogenous pepMHC complexes were present. Quantification of the total number of QL9–Ld complexes verified that even though there were greater levels of complex at some concentrations, the presence of endogenous pepMHC inhibited stimulation. We ruled out that this effect was due to inhibitory ligands such as PD-L1 on the APCs (data not shown), as well as by the observation that these same cell lines stimulated CD8+ cells very effectively. In cases of the TCR 2C, where there appeared to be antagonist activity by endogenous pepMHC, there was strong evidence for coagonist activity in the presence of CD8. In the cases (m33 and 3D-PYY) where there was no evidence of antagonist activity by endogenous pepMHC, there was also no evidence for coagonist activity in the presence of CD8. The result with 2C further supports the view that CD8 is critical in the mechanism that involves the coagonist behavior of endogenous pepMHC. However, the results also suggest that the CD8-dependent coagonist behavior will vary among TCRs, depending on their interaction with the endogenous pepMHC. This finding may be somewhat contrary to the observations of others, but we propose the discrepancy may be due to differences in the TCRs, as we used fully CD8-independent TCRs, and also perhaps due to differences in the MHC alleles that have been examined (see below). We were unable to distinguish whether some of the differences in behavior between TCR systems were a consequence of differences in interactions with endogenous pepMHC (e.g., 2C versus m33 versus 3D-PYY), or whether there was a difference among MHC alleles (e.g., Ld versus Kb versus Db), or both. Whereas a previous study suggested that TCRs do not distinguish between endogenous pepMHC in CD8-dependent coagonist effects, our results suggest that different TCRs may indeed have differences in the antagonist behavior of endogenous pepMHC in the absence of CD8. If this hypothesis is correct, then one would also predict that TCRs could also differ in endogenous pepMHC coagonist activity in the presence of CD8. The relationships between TCR affinity for agonist, TCR cross-reactivity with endogenous ligands, and apparent antagonist or coagonist effects have not been resolved. Li et al. (33), presented results suggesting that for CD4 T cells, increased agonist affinity would allow for a larger fraction of endogenous pepMHC complexes to contribute to T cell recognition. However, our results are more similar to experimental evidence from Yachi et al. showing that the most significant effects of endogenous pepMHC were seen for weak, rather than strong, agonists for CD8 T cells (15). It is possible that results will vary not only based on the affinity of these interactions but on the inherent cross-reactivity of each TCR with the array of endogenous pepMHC (34). Alternatively, perhaps some MHC alleles are more likely to be involved in antagonist or coagonist activity, depending on intrinsic properties such as cell surface lifetimes of the peptide complexes. In this respect, it is interesting that Ld complexes showed the most clear-cut evidence of antagonist and coagonist behavior. Ld has been shown to be unique among other well-studied murine class I MHC alleles, including Kb and Db. Ld is processed and trafficked more slowly (35, 36), has a lower affinity for β-2 microglobulin (35, 37), has a shorter average half-life on the cell surface (36, 38, 39), has a lower surface expression level (35, 40), and is present more frequently in a putative peptide-empty form (36, 41), presumably due to rapid peptide dissociation. These features may result in less stable TCR interactions, as a given peptide–Ld complex that binds to a TCR and dissociates may be more likely than other alleles to fall apart before potential rebinding by the TCR (42). In this scenario, in the absence of CD8, an accumulation of abortively triggered TCR complexes could result. Mathematical modeling suggested that the less exhaustively a given TCR population has been exposed to pepMHC complexes for negative selection by a given allele, the more likely that cross-reactive TCRs restricted by that allele will be present in the T cell population (43). The 2C TCR was raised from an H-2b mouse in an allospecific reaction against an H-2d stimulus, and thus the 2C TCR was not negatively selected against the array of peptide–Ld complexes. Alloreactive TCRs have been shown to have varying degrees of peptide specificity (or degeneracy; reviewed in Ref. 44). Although the 2C TCR is clearly not reactive with Ld in a peptide nonspecific manner, it is possible that it binds weakly to an unusually high fraction of peptide–Ld complexes in the affinity range that leads to antagonism when CD8 is not present. Hence, a higher level of cross-reactivity due to incomplete or inefficient negative selection may enhance effects of endogenous pepMHC. Less efficient peptide presentation by Ld in the thymus could lead to less efficient negative selection even for endogenous TCRs, leading to an Ld-restricted TCR population that is more tolerant of epitope mutations, as has been seen for elite HIV controllers carrying the HLA-B57 allele (43). Physiological occurrences of antagonism by self-pepMHC have been proposed to be common and possibly play a role in disease resistance or susceptibility (reviewed in Ref. 45). The antagonism seen here for CD8-negative T cells by endogenous complexes may have relevance to the selection of TCRs for adoptive T cell tumor therapy, which is a technique that has shown some promise as a cancer immunotherapy (46, 47). Efforts to redirect the activity of CD4 T cells to class I-restricted tumor Ags have involved introduction of a TCR that binds to a class I ligand with sufficient affinity. Previously, we have shown that CD8-independent activity would only be attained with a KD around 1 μM or less (16). Furthermore, the presence of noncognate coreceptor (CD4) would further reduce the sensitivity of T cells to their class I pepMHC targets (30). The current results show that once a CD8-independent TCR is obtained, it may also be subject to antagonism by endogenous pepMHC. Because even high-affinity TCRs (such as Y26αA and m33; Figs. 1, 2) are antagonized by lower-affinity pepMHC, it would be useful to test different candidate therapeutic TCRs for possible antagonist activity in the presence of relevant endogenous pepMHC. The exact mechanism of inducing negative, antagonistic signals to a T cell is not clear. Coreceptor recruitment has been proposed as an important distinguishing factor between agonist and antagonist ligands (48, 49). As with the effects of coagonist pepMHC, the mechanisms of antagonism may, in fact, be different for CD4 and CD8 T cells. Studies of CD8+ T cells expressing two, independent TCRs showed that providing an antagonist signal for one TCR did not decrease activation through the other TCR (50), suggesting that antagonism of CD8+ cells occurs at the level of individual TCRs. However, parallel studies of CD4+, dual-TCR T cells showed that cross-antagonism from one receptor to the other occurred (51), suggesting that antagonism of CD4+ T cells resulted in a dominant negative signal. These results imply coreceptor involvement in the antagonism, although differences in activation readouts for CD8+ T cells [specific target cell lysis (50)] and CD4+ T cells [proliferation (51)] between the two studies may be a confounding factor. Our findings in this study agree with previous findings for CD4 T cells and class II pepMHC (52, 53) indicating that coreceptor is not required for antagonism, and the effect can be mediated by TCR alone. One possibility is that pepMHC binding by the TCR outside of an optimal range initiates abortive signaling, accumulation of partially phosphorylated TCR complexes (54), recruitment of negative regulators such as SHP-1 (55, 56), and/or inefficient formation of the immunological synapse and cell polarization (57). Our investigation shows that TCR–pepMHC affinities up to 300 μM are sufficient to result in antagonist activity in the absence of CD8, whereas the same interaction can mediate activation when CD8 is present (25). It is possible for the binding properties that result in antagonism to differ with and without coreceptor participation, and the KD threshold for antagonism for CD8+ T cells might be significantly higher than 300 μM. Many naturally occurring TCR interactions with endogenous or weak agonist pepMHC are likely to fall in this intermediate range of affinity (antagonists without CD8 and coagonists or agonists with CD8). Because previous studies have shown that only a very small fraction of TCRs are constitutively associated with CD8 (58, 59), an interesting combination of signals must be integrated when a T cell encounters an APC; negative or abortive signals from endogenous or even weak agonist pepMHC binding to TCR not preassociated with CD8 must be balanced against agonist interactions with the participation of CD8. Further investigation into this phenomenon is required. We thank Hans Schreiber at the University of Chicago for providing the MC57-Ld cell line. This work was supported by National Institutes of Health Grants GM55767 and CA097296 (to D.M.K. ), Leukemia & Lymphoma Society Grant LLS 7008-08, National Institutes of Health Grants P01 CA18029 and R01 CA33084 (to P.D.G. ), and by the Samuel and Ruth Engelberg/Irvington Institute fellowship of the Cancer Research Institute (to J.D.S.).
. 1995. Positive selection of thymocytes. Annu. Rev. Immunol. 13: 93–126.
. 2006. Thymic selection threshold defined by compartmentalization of Ras/MAPK signalling. Nature 444: 724–729.
. 2002. Rare, structurally homologous self-peptides promote thymocyte positive selection. Immunity 17: 131–142.
. 2001. A low affinity TCR ligand restores positive selection of CD8+ T cells in vivo. J. Immunol. 166: 6602–6607.
. 1996. A single T cell receptor recognizes structurally distinct MHC/peptide complexes with high specificity. J. Exp. Med. 184: 1017–1026.
. 2009. An endogenous peptide positively selects and augments the activation and survival of peripheral CD4+ T cells. Nat. Immunol. 10: 1155–1161.
. 1999. Qualitative and quantitative differences in T cell receptor binding of agonist and antagonist ligands. Immunity 10: 227–237.
. 1996. T-cell-receptor affinity and thymocyte positive selection. Nature 381: 616–620.
. 2010. Peptide-MHC heterodimers show that thymic positive selection requires a more restricted set of self-peptides than negative selection. J. Exp. Med. 207: 1223–1234.
. 2005. Agonist/endogenous peptide-MHC heterodimers drive T cell activation and sensitivity. Nature 434: 238–243.
. 2002. Costimulation and endogenous MHC ligands contribute to T cell recognition. Nat. Immunol. 3: 42–47.
. 2005. Nonstimulatory peptides contribute to antigen-induced CD8-T cell receptor interaction at the immunological synapse. Nat. Immunol. 6: 785–792.
. 2007. T cell activation enhancement by endogenous pMHC acts for both weak and strong agonists but varies with differentiation state. J. Exp. Med. 204: 2747–2757.
. 2009. The impact of TCR-binding properties and antigen presentation format on T cell responsiveness. J. Immunol. 183: 1166–1178.
. 2003. Quantitative analysis of the contribution of TCR/pepMHC affinity and CD8 to T cell activation. Immunity 18: 255–264.
. 2008. Engineering higher affinity T cell receptors using a T cell display system. J. Immunol. Methods 339: 175–184.
. 1996. Self-MHC-restricted peptides recognized by an alloreactive T lymphocyte clone. J. Immunol. 157: 670–678.
. 1994. High-affinity reactions between antigen-specific T-cell receptors and peptides associated with allogeneic and syngeneic major histocompatibility complex class I proteins. Proc. Natl. Acad. Sci. USA 91: 11487–11491.
. 2003. TCRs with high affinity for foreign pMHC show self-reactivity. Nat. Immunol. 4: 55–62.
. 2000. In vitro evolution of a T cell receptor with high affinity for peptide/MHC. Proc. Natl. Acad. Sci. USA 97: 5387–5392.
. 2004. A peptide that antagonizes TCR-mediated reactions with both syngeneic and allogeneic agonists: functional and structural aspects. J. Immunol. 172: 2994–3002.
. 2008. Distinct CDR3 conformations in TCRs determine the level of cross-reactivity for diverse antigens, but not the docking orientation. J. Immunol. 181: 6255–6264.
. 2009. Engineering the binding properties of the T cell receptor:peptide:MHC ternary complex that governs T cell activity. Mol. Immunol. 46: 3000–3008.
. 1996. A residue in the center of peptide QL9 affects binding to both Ld and the T cell receptor. J. Immunol. 157: 4478–4485.
. 2009. Different strategies adopted by K(b) and L(d) to generate T cell specificity directed against their respective bound peptides. J. Biol. Chem. 284: 32551–32561.
. 2007. Cellular uptake followed by class I MHC presentation of some exogenous peptides contributes to T cell stimulatory capacity. Mol. Immunol. 44: 2184–2194.
. 2006. Quantum dot/peptide-MHC biosensors reveal strong CD8-dependent cooperation between self and viral antigens that augment the T cell response. Proc. Natl. Acad. Sci. USA 103: 16846–16851.
. 2009. Cutting edge: inhibitory effects of CD4 and CD8 on T cell activation induced by high-affinity noncognate ligands. J. Immunol. 183: 7639–7643.
. 2002. Direct observation of ligand recognition by T cells. Nature 419: 845–849.
. 1984. Immunoprecipitation of cell surface structures of cloned cytotoxic T lymphocytes by clone-specific antisera. Proc. Natl. Acad. Sci. USA 81: 573–577.
. 2004. CD4 enhances T cell sensitivity to antigen by coordinating Lck accumulation at the immunological synapse. Nat. Immunol. 5: 791–799.
. 2009. A single peptide-MHC complex positively selects a diverse and specific CD8 T cell repertoire. Science 326: 871–874.
. 1986. Slower processing, weaker beta 2-M association, and lower surface expression of H-2Ld are influenced by its amino terminus. J. Immunol. 137: 916–923.
. 1993. Model for the in vivo assembly of nascent Ld class I molecules and for the expression of unfolded Ld molecules at the cell surface. J. Exp. Med. 178: 2035–2046.
. 1998. Functional comparison of bovine, murine, and human beta2-microglobulin: interactions with murine MHC I molecules. Mol. Immunol. 35: 919–928.
. 1996. Studies of tum- peptide analogs define an alternative anchor that can be utilized by Ld ligands lacking the consensus P2 anchor. J. Immunol. 156: 4266–4273.
. 1992. Disparate interaction of peptide ligand with nascent versus mature class I major histocompatibility complex molecules: comparisons of peptide binding to alternative forms of Ld in cell lysates and the cell surface. J. Exp. Med. 175: 191–202.
. 1981. Flow microfluorometric analysis of H-2L expression. J. Immunol. 127: 580–584.
. 1991. The specific binding of peptide ligand to Ld class I major histocompatibility complex molecules determines their antigenic structure. J. Exp. Med. 173: 449–459.
. 2010. Dependence of T cell antigen recognition on T cell receptor-peptide MHC confinement time. Immunity 32: 163–174.
. 2010. Effects of thymic selection of the T-cell repertoire on HLA class I-associated control of HIV infection. Nature 465: 350–354.
. 2007. Specificity of T-cell alloreactivity. Nat. Rev. Immunol. 7: 942–953.
. 2005. Self-peptide/MHC and TCR antagonism: physiological role and therapeutic potential. Cell. Immunol. 233: 75–84.
. 2009. T cell receptor gene therapy for cancer. Hum. Gene Ther. 20: 1240–1248.
. 1997. The efficiency of CD4 recruitment to ligand-engaged TCR controls the agonist/partial agonist properties of peptide-MHC molecule ligands. J. Exp. Med. 185: 219–229.
. 2006. Altered peptide ligands induce delayed CD8-T cell receptor interaction—a role for CD8 in distinguishing antigen quality. Immunity 25: 203–211.
. 1999. Cutting edge: a test of the dominant negative signal model for TCR antagonism. J. Immunol. 162: 3761–3764.
. 1999. Cutting edge: dueling TCRs: peptide antagonism of CD4+ T cells with dual antigen specificities. J. Immunol. 163: 1750–1754.
. 1997. CD4 augments the response of a T cell to agonist but not to antagonist ligands. Immunity 7: 379–385.
. 1999. Differential requirements for CD4 in TCR-ligand interactions. J. Immunol. 163: 4811–4818.
. 1999. Partially phosphorylated T cell receptor zeta molecules can inhibit T cell activation. J. Exp. Med. 190: 1627–1636.
. 2003. Cutting edge: dependence of TCR antagonism on Src homology 2 domain-containing protein tyrosine phosphatase activity. J. Immunol. 170: 4891–4895.
. 2003. TCR ligand discrimination is enforced by competing ERK positive and SHP-1 negative feedback pathways. Nat. Immunol. 4: 248–254.
. 2010. T-cell antagonism by short half-life pMHC ligands can be mediated by an efficient trapping of T-cell polarization toward the APC. Proc. Natl. Acad. Sci. USA 107: 210–215.
. 2003. Allogeneic and syngeneic class I MHC complexes drive the association of CD8 and TCR on 2C T cells. Mol. Immunol. 39: 687–695.
. 2001. Monomeric class I molecules mediate TCR/CD3 epsilon/CD8 interaction on the surface of T cells. J. Immunol. 167: 821–826.